Scotland's First Minister Nicola Sturgeon and Scotland's Brexit minister Michael Russell. 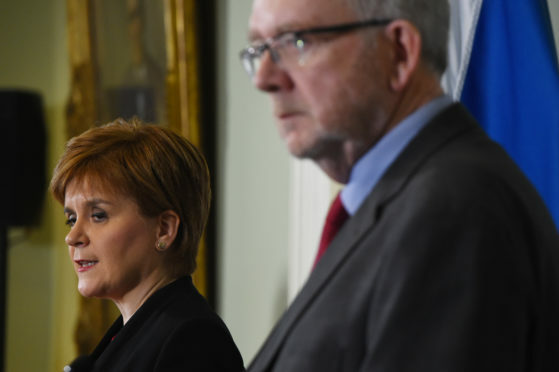 Already an hour later than usual to enable Brexit Secretary Michael Russell to make a Scottish Parliament statement lambasting the UK Government’s handling of EU withdrawal, there was a feeling that this budget was competing against events of a much greater significance. And that was without considering the fate of Theresa May. Therefore Mr Mackay, like Mr Russell, was quick to put the boot into the “chaos and uncertainty” of Mrs May’s handling of Brexit and its repercussions for Scotland’s finances. It was, Mr Mackay said, a budget “safeguard” Scotland against UK Government inspired austerity and Brexit. Although he warned that it would have to be “re-visited” in the event of a no-deal Brexit. But it was also a budget designed to tackle problems closer to home. Faced with waiting lists and staff shortages in the NHS there was a big health cash announcement in the form of £730m. Concern about standards in the classroom saw him invest £180m in closing the attainment gap. But even with these entirely praise-worthy ambitions, there was no denying that the most eye-catching aspect of the budget was the news that Scotland’s income tax regime will diverge even further from that in the rest of the UK. The proposal to make hundreds of thousands of Scottish higher earners pay more than their counterparts elsewhere in the United Kingdom proved its most controversial proposal. Mr Mackay has not to heed warnings that his approach will make Scotland a less attractive place to do business. He believes that overall tax-take will not fall. Time will tell who is proved right.